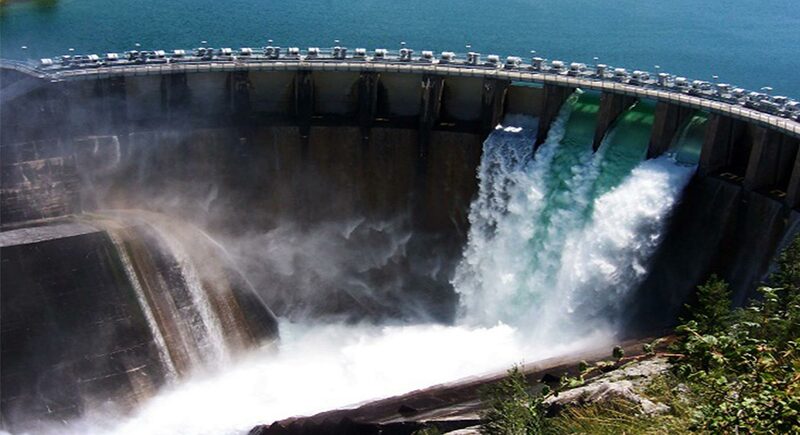 Hydropower or hydroelectricity refers to the conversion of energy from flowing water into electricity. Hydropower or hydroelectricity refers to the conversion of energy from flowing water into electricity. It is considered a renewable energy source because the water cycle is constantly renewed by the sun. Historically, one of the first uses of hydro power was for mechanical milling, such as grinding grains. Today, modern hydro plants produce electricity using turbines and generators, where mechanical energy is created when moving water spins rotors on a turbine. This turbine is connected to an electromagnetic generator, which produce electricity when the turbine spins. Hydro plant facilities can be categorized into three sizes: large (>30 MW), small (100 kW - 30 MW), or micro (<100 kW) Chambers, A. (2004). Hydroelectric. In Renewable Energy in Nontechnical Language (pp. 147–171). Tulsa, Oklahoma: Pennwell Corporation. Chambers, A. (2004). Hydroelectric. In Renewable Energy in Nontechnical Language (pp. 147–171). Tulsa, Oklahoma: Pennwell Corporation. . There are three main types of hydro plants. Impoundment facilities are the most common technology which uses a dam to create a large reservoir of water. Electricity is made when water passes through turbines in the dam. Pumped storage facilities are similar but have a second reservoir below the dam. Water can be pumped from the lower reservoir to the upper reservoir, storing energy for use at a later time. Run-of-river facilities rely more on natural water flow rates, diverting just a portion of river water through turbines, sometimes without the use of a dam or reservoirs. Since run-of-river hydro is subject to natural water variability, it is more intermittent than dammed hydro. Hydropower is the largest contributor of all renewable energy sources and accounts for 6.7% of worldwide electricity production  BP p.l.c. (2014). BP Statistical Review of World Energy BP p.l.c. (2014). BP Statistical Review of World Energy . Further growth of this mature technology may be possible, though many countries have already developed cost-effective sites. Hydropower is an abundant, low cost source of power (where applicable), despite high upfront buidling costs Ghosh, T. K., & Prelas, M. A. (2009). Energy Resources and Systems volume 2: Renewable Resources (pp. 157–210). Ghosh, T. K., & Prelas, M. A. (2009). Energy Resources and Systems volume 2: Renewable Resources (pp. 157–210). . It is also a flexible and reliable source of electricity compared to other renewable options, as it may be stored for use at a later time. Dammed reservoirs can also help with flood control, be a reliable water supply, and may be used for recreational purposes. However, there are many concerns with hydropower, particularly large dam facilities. Damming a river has a significant impact on the regional ecosystem, by flooding upstream landscapes, distrupting habitats for wildlife, blocking fish passages, and often displacing local communities. In addition, dam failures can be catastrophic, further disrupting landscapes and claiming the lives of those living downstream Boyle, G. (Ed.). (2004). Renewable Energy (Second.). Oxford: Oxford University Press.Canadian Electricity Association. (2013). Data World | Power for the Future. Retrieved June 03, 2014, from http://powerforthefuture.ca/data-world/ Boyle, G. (Ed.). (2004). Renewable Energy (Second.). Oxford: Oxford University Press.Canadian Electricity Association. (2013). Data World | Power for the Future. Retrieved June 03, 2014, from http://powerforthefuture.ca/data-world/ . Finally, hydroplants are not completely free of greenhouse gas emissions. As with most forms of energy, carbon dioxide emissions occur during construction, particularly as a result of the large quantities of cement used, and loss of vegetation in flooded areas creates methane, another greenhouse gas, as it matter decays underwater. a, b, c, d Ghosh, T. K., & Prelas, M. A. (2009). Energy Resources and Systems volume 2: Renewable Resources (pp. 157–210). ^ Chambers, A. (2004). Hydroelectric. In Renewable Energy in Nontechnical Language (pp. 147–171). Tulsa, Oklahoma: Pennwell Corporation. The energy harnessed from moving water can be used to create electricity; the two most common technologies for this are - Hydropower and Tidal Power. Electricity is the physical flow of electrons, referred to as an electrical current.